Worship leaders… team members… pastors… you can thrive with whatever you have… where you are. But, in worship ministry, excellence can be a confusing subject. So, if you want to learn how to be excellent with whatever resources and personnel you have, we have to start here: Why do we pursue excellence? This is a common question as I travel leading worship and training teams. We want to honor God as we are leading while doing our best and sounding great. But here’s the thing… the reason we pursue excellence isn’t so that people look at us. We pursue excellence so people aren’t distracted by us. This is key. Leaders… in order to lay a healthy foundation for our teams, we all need to align in this vision from the beginning. Now, we can run everything through that filter. Asking, is this distracting people from or helping people to encounter God’s presence? Because this isn’t about us. It’s about pointing people to Jesus. And all of this takes an attitude of complete surrender to whatever God wants to do through us and in His Church. I have lead worship in many churches from small to large. Some have big production teams with lights and big stages where I have seen hundreds of lives touched and changed as they encounter the presence of God. But I have also seen countless people touched and changed in a small church with no stage, one acoustic guitar and a microphone. It isn’t a question of right or wrong. The question is… what is God calling your church to? And then how can you pursue excellence with the resources in front of you? The challenge is not focusing on our lack. But, rather, gratitude for what we do have and how to honor God with it. The first step is to refine your craft. It’s difficult to be fully engaged in worship if we are distracted due to lack of preparation. This isn’t about perfection. Mistakes happen, and that’s ok. It’s about being prepared so you are fully present as you minister (whether lead or support, this applies to everyone). Do you need lessons? Ask your worship leader for suggestions! Is there a young person who isn’t ready yet musically, but has the gifting and heart? Invest in them! All of these work toward the goal of pointing people to Jesus. Next, define the musical roles on your team. For example, on a small team, if you have one guitar player and a keys player… if the guitar is lead rhythm, the role of the keys is to fill the sound with pads or strings. Or an acoustic piano would play simplified chord patterns, with more sustaining, less rhythm so not to conflict with the guitar rhythm. For larger teams, if duplicate instruments all play the same thing, the sound could be overwhelming. Remember this: less is more. And sometimes that means not playing or singing at all for a portion of the song. Leaders… you can serve your team by defining each role clearly so they feel confident in what to (or not to) play. Andrea Olson has always loved worship, writing songs for the church and leading people into and encounter with God’s presence. She has been a worship leader in Minnesota for the past 16 years. In 2010, Andrea started a unique 1:1 mentorship program for young local worship leaders. As more leaders and churches began reaching out for help and training, God grew Andrea’s passion for worship in the church and in 2014, Overflow Worship was born. 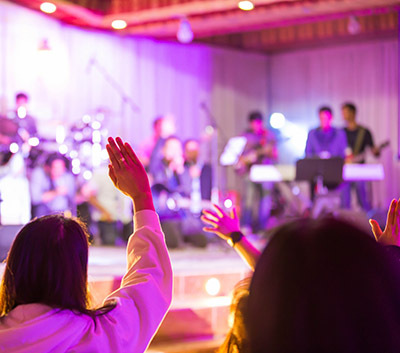 This ministry for worship leaders and teams began with the annual Overflow Worship Conference, which now, is hosting its 6th conference on October 11-12, 2019. Now, in addition, Andrea (with family in tow) travels the Midwest going into churches leading worship, training teams and equipping leaders with practical tools to thrive in their ministry.